https://www.youtube.com/watch?v=IlJ_cYqKZp8 to access the video recorded by Ric Signorella, Production Assistant of the Hoffman Estates Communications Department for Cable TV to memorialize the event that day. The startling thing is that Fred Bartels referred to this area as Schaumburg in 1848, a time before the area was officially known as Schaumburg. 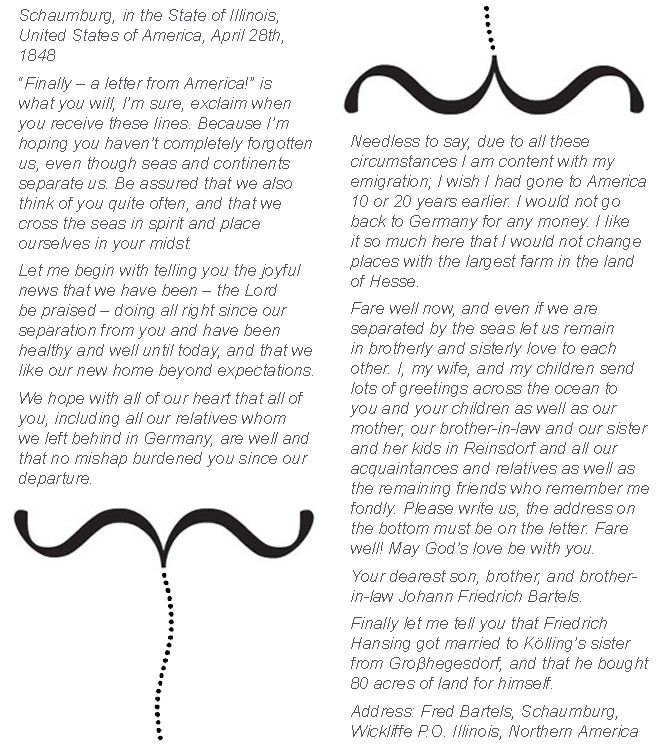 The Boeger family farmed in the area of present day Spring Valley Heritage Farm-- Schaumburg/ Plum Grove Roads. Note at the end, Mr. Bartels is getting his mail at the Schaumburg, Wickliffe P. O. Illinois, Northern America. The location in Palatine Township is believed to have been Algonquin Road near present day Roselle Road. 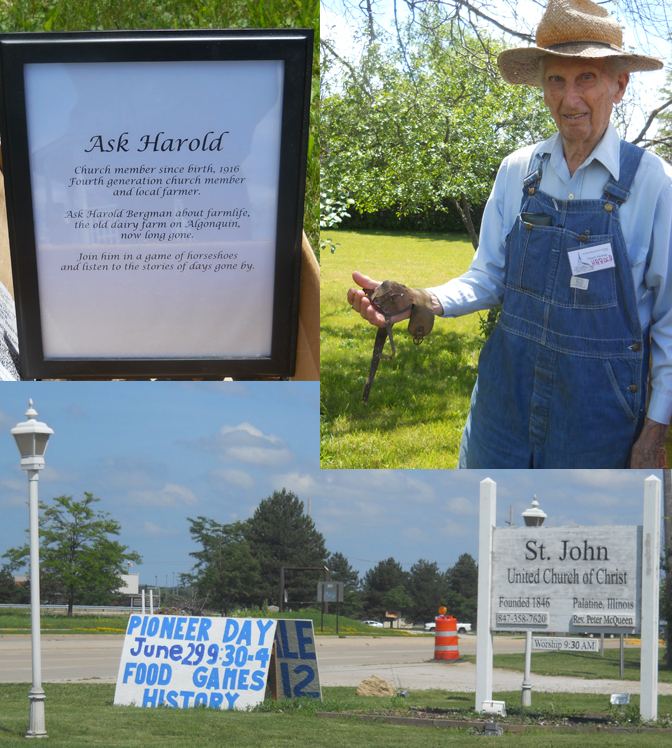 In 2012 the Schaumburg Township Historical Society participated in the first Pioneer Day celebration for the St. John Church in Palatine which has a long and rich history. So when they planned to repeat the event for June 29, 2014 we were one of the first to sign up. Nancy Lyons hosted a cemetery walk and the rest of us greeted visitors and took their picture in period garb. The highlight of the day though was speaking to Harold Bergman, one of the last of the farmers in the area and fourth generation member of the church. Harold is now 98 years young and it was a thrill to speak with him and hear him tell some of his stories of times gone by. And he was more than happy to challenge you to a game of horseshoes... that is, if you were up to it. Once again the Schaumburg Township Historical Society was the guest of the Hoffman Estates Historic Sites Commission to celebrate their annual Open House at the Sunderlage Farmhouse. June 22nd was a beautiful day, so many people lingered outside to to visit the petting zoo, help their children on to a waiting horse for a ride around the property and then of course help themselves to an ice cream cone or sundae. We have been doing this for many years but this was the second one dedicated to the memory of Sharon Kimble. Sharon was a long time resident of Hoffman Estates and a member of the historical society. Partnering with the Hoffman Estates Historic Sites Commission with an ice cream social had been her idea. Member Susan Wagner shown here was our very busy master scooper. This year we welcomed nearly 150 visitors to our Memorial Day Open House. Fortunately between historical society members Nancy Lyons, Wand Bain, David Hink, Jim Hink and Bob Vinnedge were able to answer lots of questions and meet visitors of all ages. Wanda Bain, shown here, enjoyed speaking to many school age children. They were all enthralled with he explanations of what school children experienced several generations before them that, for a while, we thought we had gone back in time with Wanda as their teacher. On May 26, after the Memorial Day Observance at the St. Peter Lutheran Church, stop by the historic one-room school house. We will be open from noon to 3 pm. This marks the first of eight days this year you don't need a reservation to visit us. The dates and times for the other seven days are listed on the Upcoming Events page. On October 5th 2013, the STDL held a program at the Schaumburg Center School entitled “Hands on History.” This was a 45 minute program presented by STHS member and retired School District 54 teacher, LaVonne Presley. The program was well received by youngsters who attended with about 20 adult family members and guests. Most all the young children were captivated by what it was like to go to a one room school house in the late 1800s in Schaumburg Township. The STHS enjoyed working with the STDL and applaud their efforts to make a program like this available to our younger residents so they can understand, first hand, how different the learning experience was more than 130 years ago. A big thank you to all our members who made our Open House Program for 2013 the most successful ever. However, the really hard work was done by David and Jim Hink who hosted the Open House and greeted visitors for all eight days this summer. 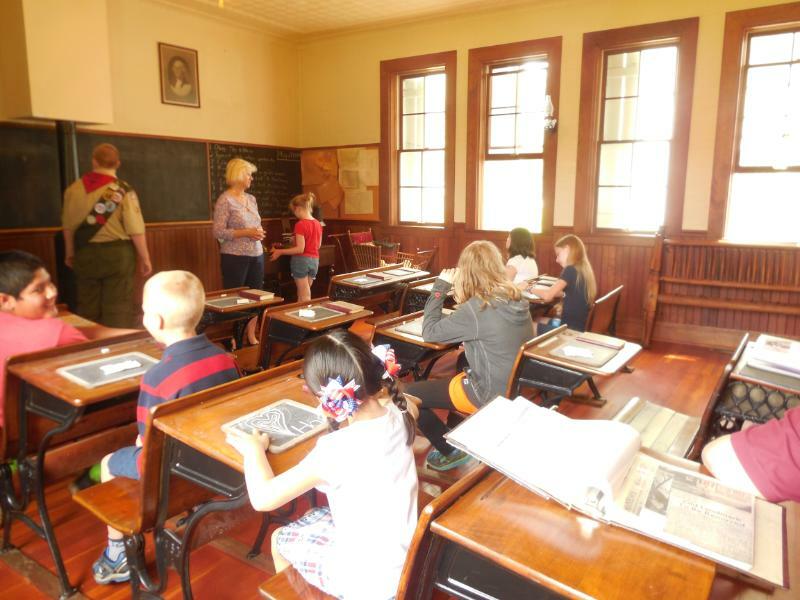 Beginning on Memorial Day and ending the Sunday after Labor Day more than 500 people visited the one room schoolhouse. In addition, David and Jim cleaned up and eliminated all the wild foliage and weeds around the entire perimeter of the building. They also helped distribute flyers publicizing the Open House schedule. But the highlight was the donation of a brand new American flag by David, Jim and Barbara Hink. The flag is now a beautiful focus that so proudly waves atop the restored flagpole between the one room schoolhouse and the original chapel of the St. Peter Lutheran Church. And it remains there for all to enjoy during the day or at night in the midst of the brilliant light that now bathes the area. For as long as we can remember the light in front of the schoolhouse has been too dim to light a path to the parking lot. And often the light would either be burned out or not even on during the hours it was needed. That has all changed now and the historical society and all the people that use the soccer park in the evening hours owe a big thank you to member Denise Suender. Denise made a case for an upgrade in this fixture. With only some minor modifications, it now matches the “acorn” lights on Schaumburg Road in the historic district, puts out much more light, operates on a photo cell and uses less energy and has much longer life. This photo was taken around 9:30 P.M. on June 28 to show you how much safer this area looks with the modified light. Thank you Denise, we appreciate your efforts.